[Updated] Premier David Burt is holding a press conference this afternoon [Jan 31] to introduce the Government’s Fintech Business Unit’s new Fintech initiative. We will have additional coverage later on and in the meantime the live video is below. Update 6.23pm: A Government spokesperson said, “Earlier today, Premier David Burt launched Phase One of the Technology Education Programme. This programme will provide sponsored training and education opportunities for Bermudians in emerging technology fields and related to Fintech. Premier Burt was joined by members or the FinTech Business Unit, Dr. Gina Tucker, Director of Education, Major [Ret’d] Allan Wayne B. Smith, Head of Fintech Business Unit, Mr. Denis Pitcher, Fintech Advisor. Also present were members of the public who have expressed a desire to work in Fintech. Premier David Burt said, “Today I am announcing that the Government, in line with our commitment to provide Bermudians the skills to become gainfully employed in the technology jobs of the future, is launching Phase One of the Technology Education Programme. 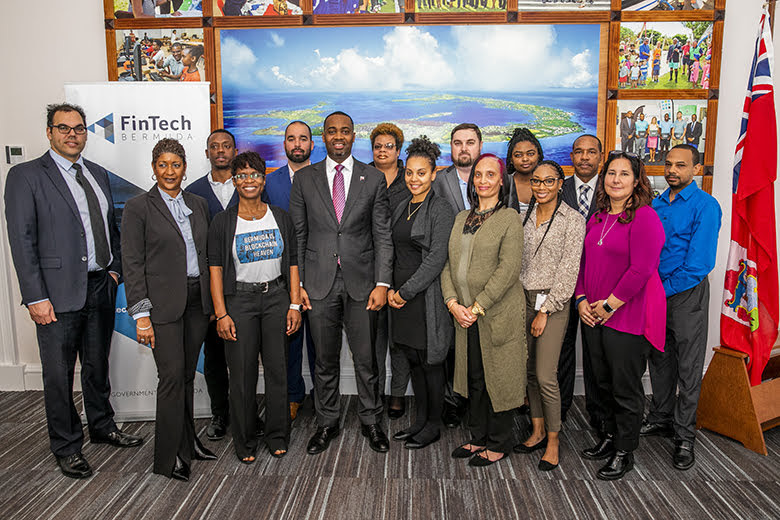 “This programme will provide sponsored training and education opportunities for Bermudians in emerging technology fields and related to Fintech. “The growing number of technology related businesses incorporating and/or planning to domicile in Bermuda will increase the demand for skilled labour. In preparation for this, the FinTech Business Unit has laid out an education and training plan that enables interested Bermudians to acquire the knowledge and skills necessary to seek employment with companies that are establishing a presence in Bermuda. “The education programmes have been designed to meet the needs of all sectors of the community, irrespective of an individual’s experience level. “5.support the work of other government entities in affording opportunities for work in traditional positions within that support FinTech companies. “It is expected that upon completion of the necessary training, individuals will gain knowledge about FinTech, and many will receive specialized certifications. These certifications which include cybersecurity, cryptology, smart contracts and regulatory compliance, will afford participants with not only the skills necessary to seek employment with the FinTech companies; but also the knowledge to launch their own technology ventures. “To date, twenty-five Bermudians have expressed a desire to work in Fintech, some of them are joining us today. They have shown a genuine interest in the industry and are excited about the opportunity to get training in this first Phase of the Fintech Business Unit’s Training and Education programme. We look forward to welcoming and helping others to learn, grow and develop. “Next week Wednesday, February 6th, at 12:30 pm or 5:30pm, Dr. Gina Tucker will be hosting a one hour Briefing Session which will be open to all Bermudians, regardless of age, who wish to learn more about the training opportunities that will be made available. “To register to attend these sessions, please go to the Bermuda job board at www.bermudajobboard.bm – and click on “FinTech Education”. BUT , Bermudians are not smart enough to work already in this industry and have to learn it . nice excuse for not hiring Bermudians. I would love the know the amount of years combined of business experience this group have. Has anyone there ever created a job? Doesn’t exactly inspire investor confidence does it? Get the popcorn ready! You cant make this stuff up….just unbelievable! Why doesn’t Burt let Dickinson know there’s no need to tax us all into oblivion. Burt the Brilliant has invented a new third leg of the economy, because he’s brilliant. Dickinson and Furbert should calm down, listen to Burt, and get ready for Fintech, any minute now. Where is the promised announcement of a crypto bank? he said it would be this week – I mean, he told the people at Davos – so tell us? Uhh. I wouldn’t goad him. Unless you want some dodgy crypto bank here. I would let that one slide. I believe he stated he ‘misspoke’ regarding that announcement. How can The Premier misspeak in Davos? Too much dark and stormy maybe. This is too serious to joke about it. He has made so much about Fintech being a third pillar and now Bermuda is “training” people for an hour or two to be experts? He needs to come clean and accept he is wrong and he will not let shady companies in Bermuda. bitcoin and crytocrap will be the downfall of Bermuda. How come we always need these little groups of people standing in the background? What is the point of them? They are people who think they might like to work in fintech. Fine, but why the photo? Burt is trying to make it look like ‘things are happenning’. They aren’t. Is that the intent? It looks like something Trump would do and that is scary for sure. How do you feel? Did you notice that Burt gave up finance to the new guy just before the order for new taxes came down? Meanwhile David Marchand is writing articles about the “businesspeople” behind Bermuda’s two most prominent fin tech startups. We need to get them to step down. Where are the marchers and noisemakers now? Guess they are all ok with being taxed into poverty. Dont you know..PLP knows it all. Why would they need bunsiness minded people? And let Dunkley and his cronies run things? We would have even a bigger problem had Dunkley driven gaming through with those questionable overseas operators! PLP was right to stop him! This is getting more and more ridiculous. Some of those pictured haven’t earned an associated degree and now will make the leap into bitcoin finance. And the end result is the hope for a job. We are flying a plane as we build it.